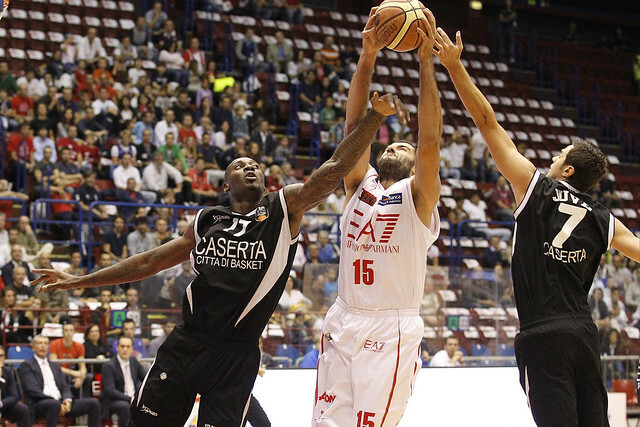 The first home game against Caserta is a winning experience for EA7. Ando also an easy and spectacular one. Last season, EA7 never scored more than 98 points in a game, this summer it touched 97 in the very first outing. The regular season winning streak, dating back to last season, is now at 9, otto last year and this last one. Coach Scariolo used all his 12 players and everybody scored. The go-to guy baton was passed from one player to another. Malik Hairston first, the Nicolò Melli and Antonis Fotsis, then in the second hald it was Ioannis Bourousis and also Rok Stipcevic and finally Richard Hendrix. Alessandro Gentile made his official return. The fans went back home happy. Everything worked out perfectly. THE FIST HALF – Malik Hairston made his personal presentation to the new season by making three staright jumpers, the first triple was made by Antonis Fotsis. The first significant lead came toward the first period end. Alessandro Gentile scores penetrating the defense and then finished a spectacular ball circulation by assisting Nicolò Melli for a three: 20-13 and time-out Sacripanti. The first double.figure margin of the season was signed by Ioannis Bourousis, from underneath assisted by Hairston with 8 minutes left in the second. But the main guy was Nicolò Melli: he made a three, makes four straight free throws and it’s 37-23 Olimpia, suddenly. Stefano Gentile leads Caserta’s rally, his three brings Juve down by six, 39-33 before a Chiotti’s basket and a spectacular reverse lay-up by Fotsis. The Greek forward is on fire: he closes a fastbreak, makes a three, scores 12 points just in the first half and it’s 51-37 EA7 before the intermission. THE SECOND HALF- Ioannis Bourousis with three consecutive baskets keep Olimpia in control early in the second half. At the end of the third four players have scored in double-figure, in spite of Fotsis, the first half leading scorer, not scoring at all in the third. Gianluca Basile at the buzzer imitates a Stipcevic three and open a 21-point advantage, 77-56. So the fourth quarter becomes an easy cakewalk, in spite of barely missing the 100-point mark.